There are 75 reviews of Reaction for Men. There is nothing in Reaction for Men that should preclude women, other than olfactory sensibilities. I find the synthetic green apple/melon combo too sharp initially, almost taking it into air freshener category; the dry-down of clean musks and soft woods is less grating but doesn't redeem it. It also showcases a dramatic decrease in volume, but the base dose linger on quite a bit. What makes me averse to melon-green apple notes is the ham-fisted nature of their usage in mainstream fresh fragrances. This one is obviously a case in point. It screams out for an MFK 'Aqua' treatment, fresh notes with a soft-hazy focus in lieu of sharpness, which would have garnered it at least an additional star. In this category of fresh-clean, out of shower and into the t-shirt fragrance, CK One is a more balanced alternative (apparently, also more gender inclusive). My favourite? Prada's Infusion d'Homme, which can be devastating on anyone; albeit pricier, but much nicer. 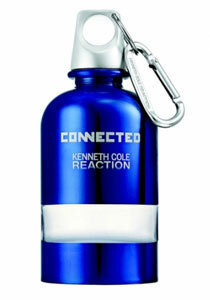 Kenneth Cole Reaction for Men (2004) is a fragrance that helped kick off the lower-price Kenneth Cole Reaction line on the male side, and is among one of the more popular Kenneth Cole masculines from the era, alongside the previous year's Kenneth Cole Black (2003). What sets Kenneth Cole Reaction for Men apart from many of its other early/mid 2000's Kenneth Cole siblings is that it takes the "ozonic grapefruit and cypress" house note that runs through most things from the 2000's Kenneth Cole era (except Kenneth Cole Black), and pushes it in a much greener direction, surrounding it with green fruits, aromatics and vegetal elements. The casual jeans-oriented line couldn't have asked for a more relaxed flagship fragrance to be honest, and the early 2000's couldn't have really asked for a more laid-back freshie either, amidst all the Iso E Superwoods, caramel gourmands, shrill ozonics, and surviving "Beige Age" 90's scents filled to the gill with calone and geranium. Kenneth Cole Reaction for Men is indeed a reaction to the trends of the day, and managed to be safe and still invigorating at the same time. The caveat here is that haters of freshies will obviously hate this too, and there are plenty of musky animal glands and mossy barbershop standards still roaming the wild for them to snort off their shirt cuffs, and with over a decade on the market, Kenneth Cole Reaction for Men also has the benefit of not feeling too modern but not being old-fashioned either, for those seeking distinction without being seen as too dated. The biggest characteristic note in Kenneth Cole Reaction for Men's opening is the grapefruit carried over from the debut Kenneth Cole New York Men (2002) and a neat granny smith green apple note, paired astutely with dry lime, a honeydew melon note (that's probably calone), and good old bergamot. From that stinging fresh and slightly-alcoholic opening comes in the real star of the KC and the Sunshine Reaction show: a very refreshing cucumber mixed with muguet and dry patchouli. The cucumber is love or hate with a lot of folks, but it is also used in the unsung Wild Country Outback (2003), which perfumer Frank Voelkl may have copied because he worked with Avon as well at that time and composed or co-composed many of their masculines in the 2000's. Either way, the cucumber is just amazingly green and soft here, mixing with the dry patchouli and white floral muguet accord delicately. The base is where this does start to fall apart however, as the trademark Kenneth Cole cypress is flanked by laundry musk, a cheap sandalwood proxy made with Iso E Super, and a scant sliver of oakmoss for skin gravity. However, for as inexpensive as this is, you can really just refresh the middle and top after about 6 hours and be back in produce aisle heaven again for another few hours until home, especially on a hot day where something like this can be the difference between a good mood and a bad one in high humidity. Wear time total is about 8 hours without any extra sprays, and sillage is moderate unless you over-apply. It goes without saying that this is a purely casual affair, if the associated clothing line isn't any indication. I can see why this stays so endearing, as Kenneth Cole Reaction for Men is about as close to a Men's version of Calyx by Prescriptives (1987) as it gets, and guys who love fruity fresh vegetal smells but are afraid to venture over the invisible gender fence can look to this for a good hot weather fix. Kenneth Cole Reaction for Men spawned 2 lesser-known flankers that rarely appear in stores these days, but still exist in some fashion, with face-lifted packaging to resemble the original pillar (as they initially didn't), and they are: Kenneth Cole Reaction Thermal (2006), and Kenneth Cole Reaction T-Shirt (2009). Both of these fragrances take the main accord of the original Reaction for Men in different but less-interesting directions, and probably are only worth exploring for completists. Overall, if I was to recommend one Kenneth Cole masculine to stand as representative of the house, it likely wouldn't be Kenneth Cole Reaction for Men despite its massive success, as it's too narrowly-focused for that honor, but it is one of three that I would recommend anyone interested in the house during its heyday give a sniff, followed by Kenneth Cole Black and Kenneth Cole Signature (2005). Together, these three represent what it was all about to wear Kenneth Cole in the previous decade, although special honors also goes to RSVP (2006) for trying to staple on sandalwood-inflected oriental tones to that house cypres/grapefruit accord. For a 2000's freshie not full of aquatic dihydromyrcenol or stinging ozonic citrus, Kenneth Cole Reaction for Men is a diamond in the rough, but won't be enough for folks with more discerning tastes as it doesn't really deliver in the base nor does much to hide its synthetics. Still, I give this a thumbs up for creativity and I'd totally rock it on the rare 90-degree days we get here up in the pacific northwest. I don't think I could daily-wear something this linear, but I also don't think it was really meant for that. Reaction for Men has a sharp, citrus melon and apple in the opening. The apple is actually very nice and could fetch a compliment or two. Probably best-suited for summer casual wearing. Later, the drydown gets more synthetic and just becomes a musky, generic scent. Longevity is good, lasts most of the workday but the projection is only average. Although it hasn't been out for many decades, Kenneth Cole Reaction strikes me as a classic in its own way. The balance seems to have been struck well between the very green apple head note all the way to the base with the sandalwood and musk (excellent combination). Reaction ends up having a light woody character, accented tastefully by the patchouli and musk. Unlisted lily-of-the-valley note adds a delicate, rounded out floral touch overall. Reaction for Men is all over the place, in discount clearinghouses as well as upper-end department stores, so it's not hard to get a sample to try out this still relevant, close to legendary scent from Kenneth Cole. Currently my favorite, I'm getting compliments on this one, especially from my wife who surprised me when she said she could smell it on my skin after 10 hours. It does die down but that's a good thing since it opens really strong on the skin. Citrus and floral, honestly it smells like magnolia bloom and maybe mandarin orange. Very reminiscent of the original formulation of Aqua di Gio for men. Reaction's noncitrus fruity top notes are unusual and very nice, with just enough going on below to provide acceptable balance. The melon and green apple portion reminds me of the melon and kiwi scent used in many common products. I can't imagine this would annoy anyone unless grossly over sprayed. Projection is somewhat weak and longevity is rather poor. I am not a fan of modern light watery frags like reaction. However, I would consider this to be better than most. Not enough appeal to get my thumbs up. Might be a true gem for others. There are no member images of Reaction for Men yet. Why not be the first?